Home sweet home. Our short holiday is over. Half the times I tell friends that I managed to spot a landmark from the air they give me this look that says: we believe you but you need to get a coffee... Well, today was special. 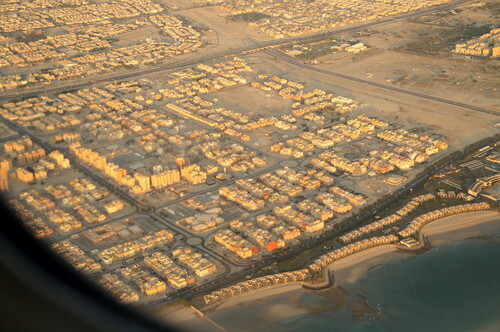 This was Mangaf during our landing this morning, shortly after sunrise. At the bottom of the photograph are the gardens and chalets of the Hilton Kuwait Resort. In the distance, highway 30 and Subiya are visible. Zooming in I can even point to our house. A lot is said and very little is done! If every house planted a tree in front, the rest of Mangaf would look like the Hilton Resort. Thank God for the Sea. planting trees should be made mandatory everywhere! thats a nice pic, so much cloesr home! was just wondering, as im new around these areas, and slowly getting familiar, would you happen to know what is this huge monstrously long building coming up ...around the area uve taken this pic. It would be somewhere behind the mosque if im right. Keep wondering what it is, each time i cross it. You're right. Especially in our region! yes that is the one! :) But what i gathered is, it is to be residential complexes?? that baffles me!